The only disclaimer or forewarning is simply that the choice of wording here is going to be intentionally repetitive with respect to just why and how it is that reason (…on the one hand…) and morality (…on the other hand…) either succeed in finding singularity or else fail in finding singularity. The metaphysical wellspring of all ontological possibility reveals – given the Christian’s thoroughly Trinitarian metaphysic – love’s timeless reciprocity and reason’s final felicity in the ontological singularity that is the Trinitarian Life and in fact nothing less than the *singular* metaphysical wellspring of Love and Necessity will do as we press in upon all possible contours here. The topographic map which results with respect to *that* – with respect to Possibility’s express Fountainhead – sums to the singular rational/moral landscape of the triune. The occasionally repetitive syntax is used so that at *each* step through our progression we are forced to recall – and include – each claim along the way. Reason in her proper role as truth-finder is obligated to chase after the fundamental nature of X, whatever X is. The rational with respect to reason as truth-finder cannot be ontologically seamless with the moral given the No-God paradigm wherein irreducible self-giving trades on irreducible indifference and the convertibility of the transcendentals is finally illusory. Given the No-God paradigm what reason claims to apprehend is (….given the non-convertibility of the transcendentals…) ultimately unable to traverse the ontic-ocean from the good and the beautiful and to the real. She (…reason…) in her proper role as truth-finder is obligated to chase after what *is*, after *facts* and justifiably so. As such the Non-Theists Hume, (physicist) Sean Carroll, Alex Rosenberg, Michael Ruse, and countless others find no obligation on reason’s part to prefer, chase after, the scratching of one’s finger over the destruction of the world. That is to say that the “morally *un*-reasonable” is, simply, impossible given the No-God paradigm’s appeal to the metaphysically absurd concept of ontological cul-de-sacs wherein irreducible self-giving trades on irreducible indifference and the convertibility of the transcendentals is – at bottom – illusory. There again we find that in any No-God paradigm what reason claims to apprehend is (given the non-convertibility of the transcendentals) ultimately unable to traverse the ontic-ocean from the good and the beautiful and to the real. Whereas the Trinitarian processions of love’s timeless self-outpouring find that the rational with respect to reason as truth-finder is in fact ontologically seamless with the moral. Therein (to borrow a phrase from Feser) “….what reason therein apprehends is (given the convertibility of the transcendentals) as good and beautiful as it is real….”. The triune God presents us with the timeless diffusiveness of self-giving as such relates to the Ontic-Self in totum which of course presents reason with reality’s irreducible substratum. Paradigmatically speaking, such is a radically different explanatory terminus than we find in any Non-Theism. The Golden Thread of Reciprocity is affirmed by natural theology, is perceived by reason, is seen by Non-Theism, but Non-Theism must foist a metaphysical impossibility in order to claim her given that in that paradigm irreducible self-giving trades on irreducible indifference and the convertibility of the transcendentals is finally illusory. Whereas, in the pursuit of coherent definitions with respect to the fundamental nature of reality it is the Christian metaphysic whereby reason affirms that the “A” and the “Z” of reality in fact carries the rational mind into an ethic of irreducible and self-giving reciprocity – such that it is the case that “GOD” or “Ultimate Reality” is in fact love. An immutable and cruciform love housed within the ceaseless and Self-Giving diffusiveness of the Ontic-Self in totum vis-à-vis Infinite Consciousness logically forces an unavoidable reductio ad deum. Such contours carry reason towards reality’s irreducible substratum within love’s timeless reciprocity amid those uncanny Trinitarian processions housed in “Being Itself”. That is the proverbial umbrella beneath which all other definitions in fact live and move and have – obtain – their “being”. Paradigmatically speaking – once again the Christian metaphysic thereby constitutes a radically different explanatory terminus than we find in any Non-Theism and in fact we find – once again that the attempt to “add” to any Non-Theistic paradigm’s irreducible substratum – ad infinitum – attempts a metaphysical absurdity whereby irreducible self-giving trades on irreducible indifference such that the convertibility of the transcendentals which reason apprehends is finally illusory. Humanity’s general consensus on several fundamentals is expected given natural theology. 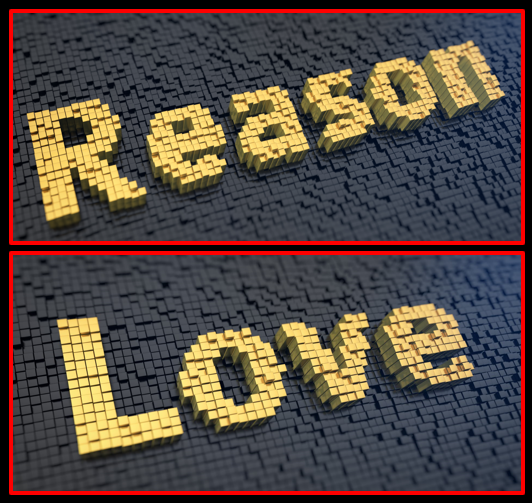 The problem with Non-Theism is that it sees The Golden Thread Of Reciprocity but it cannot connect it to reason’s obligation in her (reason’s) role as truth-finder (….see Oderberg and what he terms the fundamental test or the primary criterion of the moral a few paragraphs down…). Within any Non-Theistic substratum it is the case that reason, will, appetites, and reality find no irreducible moral nature to chase after, to fulfill, to reason towards. Non-Theistic maps of all kinds lack any such ontic-terminus and are – painfully – therefore eternally open-ended. All Non-Theistic definitions stream – ad infinitum – from a metaphysical bedrock within which reason is found attempting the metaphysical absurdity of irreducible self-giving trading on irreducible indifference and the final sum of that irrationality is nothing less than a kind of ontic-psychosis in that the convertibility of the transcendentals which reason apprehends is finally illusory and ultimately unable to traverse the ontic-ocean from the good and the beautiful and to the real. Whereas, within the Christian metaphysic it is the aggregation of logical compulsory moves which carries reason (….in her proper roles as truth-finder…. )into a thoroughly Trinitarian metaphysic constituting the timeless diffusiveness of self-giving as such relates to the Ontic-Self in totum as nothing less than Being Itself presents reason with an irreducible substratum within the contours of love’s indestructible reciprocity. All definitions stream from *that* metaphysical wellspring of all ontological possibility such that the Imago Dei itself and Reasonitself and the Beautiful itself and the Rational itself are – all – in fact ontologically seamless with what is nothing less than the Moral landscape. Reason as truth finder has every (justified) prerogative to chase after reality *as*reality. Given the non-Theistic paradigm, the rational is (…therein…) perfectly seamless with the (…non…) moral. Enter the “ontic non-entity” of the Non-Theist’s blind-epistemic which he labels “sociopath”. Whereas: Love’s timeless self-giving in and of Trinitarian processions awaits reason at the ends of all vectors (….given the Triune God…) such that should reason chase after some other constitution amid “one-another”, some other form or procession or contour, she would then be (…factually…) contra–reason, or factually *un*reasonable. The irreducible rationalis (…therein…) perfectly seamless with the irreducibly moral. Regarding the pains of Non-Theism’s eternally open ended teleology vis-à-vis “goal” (…yes – it is true – as that statement reveals the absurd…. ), see Oderberg’s fundamental test or primary criterion of the moral a few paragraphs down. The Non-Theist’s explanatory terminus is eternally open ended. And irreducibly indifferent. And reason knows it which is where the problem is found for the Non-Theistic paradigm given that she (…reason…) has an appetite for facts. Reason is obligated (…in her fact-role as truth-finder…) to chase after *facts*, after the fundamental nature of X, whatever X is. That a few Non-Theists hold out and try to disagree with Hume, Carroll, Rosenberg, Ruse, and that growing tide of younger, nervier Non-Theists with respect to the nature of reason and reality is interesting, though the premises and arguments of the hold-outs are not nearly as cogent as the crisp intellectual honesty seen in that bolder current. Therefore it would be helpful if the hold-outs highlight some of the arguments of Rosenberg, Ruse, Hume, and Carroll in charitable form and then demonstrate where they fall down regarding the fundamental nature of reason and reality. We’d enjoy reading the hold-out’s demonstrations of where those rather bright fellas go off the rails. That’s enough here as the best and brightest of the Non-Theists have already done the Christian’s work for him. Hence we need not even introduce the thoroughly Trinitarian metaphysic of the Christian nor love’s timeless reciprocity therein which constitutes reality’s irreducible substratum. Nor the fact that we find reason in her proper role as truth-finder factually obligated to chase after the fundamental nature of X (…which is *always* the case…) where X is the only (…morally…) reasonable option – namely that unique substratum of love’s irreducible nature. Of course reason is *free* to chase some *other* end, only, then she will have ceased in her (proper) role as truth-finder (… contra-reason….) and will then have chased after the factually (…and morally…) *un*-reasonable. The fundamental test of morality is whether an act is directed by reason to man’s ultimate end. Now the ultimate end is just another way of talking about the ultimate appetite or essential tendency (perhaps tendencies/appetites in the plural) the fulﬁlment of which perfects human nature. To appeal to the ultimate end is, from the ontic point of view, to dismiss the idea that there can be an endless series of appetites, each one such that its fulﬁlment is at the same time the means to the fulﬁlment of the next one in the series, where the next one will be broader, more general or all-encompassing. To countenance the thought is effectively to deny that human beings can ever fulﬁl their natures, that they can ever be just good. Apart from the intolerable hopelessness this would inject into morality, it would involve attributing a kind of inﬁnite nature to a manifestly ﬁnite being, which verges on metaphysical absurdity. From the practical point of view, the appeal to an ultimate end is just to endorse Aristotle’s famous doctrine that all practical reasoning must ﬁnd a terminus. Aristotle’s discovery, as opposed to invention, properly orients or aims reason as truth-finder. We say “discovery, not invention” because chronological mapping of epistemological developments through history never can define ontological – metaphysical – ownership of ultimate truths. Hence morality before Sinai – because *God*. Hence morality after Sinai – because *God*. The force of law (….and that includes Sinai…) just isn’t much according to Scripture’s definitions of Moral Excellence. Of course popularity and the day’s latest fashion are all the Non-Theist’s tools will allow him and so he has got to dance to that melody within his paradigm’s continuum of eternally open-ended cascades of cosmic flux. Whereas,  Christianity’s metaphysic of course shows how disharmonious that “culturally normative” Non-Theistic melody truly is and  history itself is a good demonstration of that disharmonious-ness. Therefore Christianity, history, and reason all track together in one seamless narrative throughout all of Mankind’s painful peaks/nadirs. We find in the No-God paradigm (…..wherein irreducible self-giving trades on irreducible indifference and the convertibility of the transcendentals is finally illusory…) that reason, will, appetites, and reality find no irreducible moral contours to chase after, to fulfill, to reason towards. Non-Theistic maps of all kinds lack any such ontic-terminus and are – painfully – therefore once again found to be eternally open-ended. Hume rightly observed that, given such tools, it is not and in fact cannot be contrary to reason (….in her proper role as truth-finder….) to prefer the destruction of the whole world over the scratching of one’s finger. Hume was right after all. And Carroll, Ruse, and Rosenberg with him. Again: It would be helpful if the proverbial Non-Theistic hold-outs highlight some of the arguments of Rosenberg, Ruse, Hume, and Carroll in charitable form and then demonstrate where they fall down regarding the fundamental nature of reason and reality. Non-Theism’s appeals to mutable perfection (….”god”….) seems odd. As does Non-Theism’s eternally open-ended “goal” (…”good”…). Precision is a priority here and so “odd” is not the right word. A better term would be either  metaphysical impossibility or perhaps  absurdity. As we move farther downstream – or upstream depending on one’s approach – the necessary transcendentals which the Non-Theist finds himself in need of are not convertible in his attempt at an “ontic-cul-de-sac”. Why? Because there are no such realities as ontological cul-de-sacs. In various fictions perhaps there are but not in the real word as we actually find it, such “ontology” is – being committed to this or that cul-de-sac – finally illusory. The eternally open ended teleology of Non-Theism is forever just a few steps removed from successfully obligating reason (…in her fact-role of truth-finder…)should she disagree with Goal-X. Non-Theism has not overcome Hume’s (…and so on…) rational refutation of the morally *un*reasonable. Reason finds no obligation to chase after the illusory and therein “…useful but not true…” is all that “emerges”. Why? Because, given the nature of cul-de-sacs, that is all that *can* emerge with respect to reality’s irreducible substratum. Of course, even there the employment of the term “useful” again begs the question but, as that is all Non-Theism has to work with, there’s no need to press the point. Paradigmatically speaking, such is a radically different explanatory terminus than we find in the Christian’s metaphysic. The Golden Thread of Reciprocity is affirmed by natural theology, is perceived by reason, is seen by Non-Theism, but Non-Theism must foist a metaphysical impossibility as irreducible self-giving trades on irreducible indifference and the convertibility of the transcendentals is finally illusory. Within the Christian metaphysic it is the aggregation of logically compulsory moves which carries reason (….in her proper roles as truth-finder….) into a thoroughly Trinitarian metaphysic constituting the timeless diffusiveness of self-giving as such relates to the Ontic-Self in totum as nothing less than Being Itselfpresents reason with an irreducible substratum within the contours of love’s indestructible reciprocity. All definitions stream from *that* metaphysical wellspring of all ontological possibility such that the Imago Dei itself and Reasonitself and the Beautiful itself and the Rational itself are – all – in fact ontologically seamless with what is nothing less than the Moral landscape. Just as it is necessarily true that “Being Itself” cannot be “just a little bit less” than infinite with respect to God ←→ Miracles (…as in “a bit too much” of GOD© or as in “not quite enough” of GOD©…), in the same way it is necessarily true that “Being Itself” cannot be “just a little bit less” than irreducible objectivity. The metaphysical fountainhead of all possibility that just is reality’s irreducible substratum ultimately forces all definitions and, for painfully obvious reasons, the rational with respect to reason as truth-finder cannot be ontologically seamless with the moral given the No-God paradigm wherein irreducible self-giving trades on irreducible indifference and the convertibility of the transcendentals is finally illusory. Given the No-God paradigm what reason claims to apprehend is (….given the non-convertibility of the transcendentals…) ultimately unable to traverse the ontic-ocean from the good and the beautiful and to the real. Whereas, there is a metaphysic which is far more robust and lucid which is found housing not only far more explanatory power but which is also found successfully traversing the vast Oceans of Reason Itself without ever coming upon that fateful Edge of Non-Theism’s Flat World there at the End of Reason Itself. Therein the annihilation of reason follows hard on the heels of love’s annihilation as we press in, and that just won’t do. Whereas, the rational mind seeks to prize and retain reason itself, even as the rational mind seeks to prize and retain logic itself, even as the rational mind seeks to prize and retain love itself, and – just the same – the rational mind finds – discovers – all such currents streaming from that metaphysical fountainhead of all possibility that just is reality’s irreducible substratum. As it turns out, a thoroughly Trinitarian metaphysic emerges. Reason’s obligation – in her proper role as truth-finder – is to chase after the fundamental nature of X – whatever X may be – and that directly relates to this or that paradigm and whether or not, in fact, the irreducibly rational is ontologically seamless with the irreducibly moral. Any convergence of vectors in a metaphysical epicenter or fountainhead of irreducible Self-Giving vis-a-vis the Ontic-Self in totum reveals that the irreducibly rational is ontologically seamless with the irreducibly moral. There we will discover reason’s obligation in her proper role as truth-finder. For clarity: Reason is not obligated to chase after the illusory “qua” Truth. Why? Simply because of the fact that the metaphysical absurdity of ontological cul-de-sacs just won’t do when what is necessary and sufficient sums to reality’s ontological continuum. Self-Giving with respect to “Being Itself” forces our hand. The “term” / “definition” with respect to “GOD” / “Being Itself” thereby referents nothing less than the immutable love of the Necessary Being vis-à-vis love’s timeless and self-giving diffusiveness of the Ontic-Self in totum. and Necessity will do as we press in upon all possible contours here and the topographic map of that very Wellspring just is Meta-Christianity. The Objectively Moral comes with and in and by the Objectively Rational, through the seamless singularity of The-True and The-Good, that is to say, through the seamless singularity of The-Rational and The-Moral. Reason’s lack of any obligation to chase after the illusory “qua” Truth as per Hume stands intact given any Non-Theistic paradigm. That tends to be an arena which a large percentage of our Non-Theist friends are too timid to enter into given the fact that the phrase “morally un-reasonable” sums to a metaphysical absurdity. Convertibility: We begin to discover just why it is the case that the rational with respect to reason as truth-finder cannot be ontologically seamless with the moralgiven the No-God paradigm wherein irreducible self-giving trades on irreducible indifference and the convertibility of the transcendentals is finally illusory. Given the No-God paradigm what reason claims to apprehend there in that golden thread of reciprocity is (….given the non-convertibility of the transcendentals…)ultimately unable to traverse the ontic-ocean from the good and the beautiful and to the real. The irreducible substratum of love’s timeless Self-Giving in and by and through those uncanny Trinitarian processions finds the The Always and The Alreadycompelling the convertibility of the transcendentals even as it is there alone where we find that the irreducibly Moral is in fact ontologically seamless with the irreducibly Rational. All such contours relate to Reason herself in her proper role as truth-finder and her obligation to chase after The True which in and by and through the convertibility of the transcendentals is to chase after The Good. Granting Monism or Dualism to the Non-Theist is easy enough. Consider it done. We observe, then, that our Non-Theist friends have *not*, with said grant, managed to fund the problem of closing any moral loop. In other words, short of “Love and Necessity” in singularity we still lack the means to close any moral loop as at some ontological seam somewhere any such paradigm will – finally – do to the Self and to Love and thereby to The Good what Pantheism in fact does to them. The narrative of love and of necessity in all such paradigms is one where we find two X’s which are forever disparate as the two fail to precede, define, and outdistance all other lines in and by and through their own metaphysical singularity/unicity. It is catastrophic. Love will lack the Necessary, or, the Necessary will lack Love. The rational mind demands lucidity through and through and we find that Necessity void of love’s necessary content arrives on scene at some ontological seam somewhere and such lovelessness just won’t do. We error to assume the whole of morality is a thorough-going intentionality. It isn’t. Intention, even it emerges, just won’t do the work of obligating reason to chase after love’s topography. Hume stands undefeated in all such granting-of-wishes as “The Good” presses in as to what reason is and is not obligated to chase after for reason’s role is Truth and should the end of Truth fail to land in the lap of Self-Giving – Full Stop (….we’ll leave it to folks to find the necessary contents of love’s “Self-Giving” in their Necessary X’s rather than their Contingent X’s….) – then – again for obvious reasons – Hume stands undefeated. That said, many Non-Theists claim all sorts of things about their mathematical models and what they can account for, but there’s been no one so far who successfully traverses that ocean short of equivocating somewhere between “upstream” and “downstream” in a logical impossibility aimed at inventing a kind of ontological cul-de-sac. Sean Carroll’s syntax roles on quite strong in his Poetic Naturalism only to gently slip into the illusory syntax of useful-but-not-true. Within Christian theology there is a thought – a story – of the infinite that is also the thought – the story – of beauty; for pagan philosophy and culture, such a confluence of themes was ultimately unthinkable. Even Plotinian Neoplatonism, which brought the Platonic project to its most delightful completion by imagining infinity as an attribute of the One, was nonetheless compelled to imagine the beauty of form as finally subordinate to a formless and abstract simplicity, devoid of internal relation, diminished by reduction to particularity, polluted by contact with matter’s “absolute evil”; nor could later Neoplatonism very comfortably allow that the One was also infinite being, but typically placed being only in the second moment of emanation, not only because the One, if it were also Being, would constitute a bifid form, but because being is always in some sense contaminated by or open to becoming, to movement, and thus is, even in the very splendor of its overflow, also a kind of original contagion, beginning as an almost organic ferment in the noetic realm and ending in the death of matter. Christian thought – whose infinite is triune, whose God became incarnate, and whose account of salvation promises not liberation from, but glorification of, material creation – can never separate the formal particularity of beauty from the infinite it announces, and so tells the tale of being in a way that will forever be a scandal to the Greeks. For their parts, classical “metaphysics” [rather than rigorous metaphysics] and postmodernism belong to the same story; each, implying or repeating the other, conceives being as a plain upon which forces of meaning and meaninglessness converge in endless war; according to either, being is known in its oppositions, and oppositions must be overcome or affirmed, but in either case as violence: amid the strife of images and the flow of simulacra, shining form appears always only as an abeyance of death, fragile before the convulsions of chaos, and engulfed in fate. There is a specular infinity in mutually defining opposites: Parmenides and Heracleitos gaze into one another’s eyes, and the story of being springs up between them; just as two mirrors set before one another their depths indefinitely, repeating an opposition that recedes forever along an illusory corridor without end, seeming to span all horizons and contain all things, the dialectic of Apollo and Dionysus oscillates without resolution between endless repetitions of the same emptiness, the same play of reflection and inversion. But the true infinite lies outside and all about this enclosed universe of strife and shadows; it shows itself as beauty and as light: not totality, nor again chaos, but the music of a triune God. Nietzsche prophesied correctly: what now always lies ahead is a choice between Dionysus (who is also Apollo) and the Crucified: between, that is, the tragic splendor of totality and the inexhaustible beauty of an infinite love. Non-Theistic means and ends (….be they non-theistic evolution or any otherlandscape….) lands in the eternally-open-ended and therefore the syntax of goal/closure is unintelligible as that same eternally open-ended landscape finally void of Being vis-à-vis Self-Giving in fact built *all* epigenetic/genetic memes – bothreligious and non-religious – Hard Stop. Every permutation. Every combination. The Net Sum: metaphysical armistice – eternally colliding ontological equals – Hard Stop. Whereas, in the Christian metaphysic we discover factual – metaphysically necessary – differences between The Good and various deficiencies thereof even as we discover such nuances as, say, the fact that to whom nothing is given, nothing is required, to whom little is given little is asked, to whom much is given much is required, and that, say, forgiveness is tied into not-knowing. All of that and far more which continues to arrive on scene is far more coherent than what Non-Theism brings to the table here. Locating the irreducibly objective moral fact is not complicated when one does not have to try to find a pretend line in the sand where there is in fact no line to find. There’s a reason morality precedes Sinai just as there is a reason morality outdistances Sinai – and – should our Non-Theist friends embrace thatunmistakable truth of Scripture they will find that, then, that same reason doing real, actual “ontic-work” throughout the rest of reality’s metanarrative as well. The first metric just is the last metric and such just is immutable love as that which reason apprehends is – given the convertibility of the transcendentals – actually or factually real. Love’s timeless reciprocity carries us into those uncanny Trinitarian processions which in fact are reality’s irreducible substratum there amid Self/Other – what D.B. Hart somewhere terms that “…eternal ‘one-another’…“. We need not be concerned about Privation for in the Triune God it is the case that the Self is both The-Good and The-Whole such that the term “Hate” is not necessary for that move of Privation within the Trinitarian Life as the I AM traverses both history and consciousness. Only the Trinity solves that dilemma with respect to love’s perfectly free and volitional contours amid Self/Other (…on the one hand…) and that which is Necessary (…on the other hand…). No other metaphysics solves that problem. It is – again – uncanny that Privation is not only necessary in the Trinitarian Life but, also, it is necessarily the case that the term “Hate” cannot be ascribed to Intra-Trinitarian Privation given that that term is referencing “Good-Minus-Some-Thing” and – obviously – to ascribe such to the seamlessness of Divine Simplicity (…on the one hand…) and/or to the Christian’s Triune God (…on the other hand…) sums to ascribing roundness to squares or sound to colors. Nothing less than the singularwellspring of Love and Necessity will do and that is precisely where the Christian metaphysic finds both its A and its Z as the collocation of reason, logic, and love carry us into a thoroughly Trinitarian metaphysic.